Shoulder-length hairstyles are quite possibly the easiest to pull off, making them the cut we're going to opt for when we want a mid-season refresh. The thing is, they're not as daunting as short hairstyles, and they don't require the styling upkeep of a longer length. They also work with any texture, from tight curls to fine pin-straight strands—and, despite what you might think, they actually offer up some serious styling opportunities. Essentially, this mid-length is the easiest suits-all style. You can also play fearlessly with colour (if you so wish), and because regular trims are required to keep the hair grazing your shoulders, you won't have to suffer from split ends. Not convinced? Take a look through the gallery below and get used to the idea. Okay, we've already told you why we love this look, but take a look for yourself and draw your own conclusions. Mila looks mega, right? Blunt ends were everywhere in 2018 (just as we predicted here) and Emilia Clarke's super-healthy platinum long bob is making us want to continue the trend into 2019, too. But if you're considering going super blonde, make sure you stock up on the relevant care products, like Colour Wow's Brass Banned Correct and Perfect Mousse for Blonde Hair (£13). Oprah Winfrey's glossy blow-dry looks like the work of a strong round brush (Raincry's Magnesium Volumizing Brush Plus, £55, is particularly sturdy) and a gloss-inducing hair serum like Davines's MINU Illuminating Hair Serum (£20). Kate Mara adds texture to her shoulder-length hairstyle with beachy waves and balayage. Love Kim Kardashian West's long, sleek, minimal hair as of late but don't want to deal with extensions? Olivia Culpo shows how you can create the same feel with a mid-length cut. With carefully placed layers and a sharp centre part, Yara Shahidi's afro-textured hair looks great at this length. Lucy Hale is known for her striking dark hair colour, but these subtle waves and the slightly above-the-shoulder crop add a soft edge to the style. Kerry Washington shows that a high-shine, sleek bob with a full fringe looks super sophisticated. Amp up the sheen with Sachajuam Straight and Shine Spray (£22) before straightening. Waves can often be one of two things—retro or beachy. Jessica Alba has mastered a wave that is neither of those; it just looks super groomed. The secret? Use a large-barrel tong like the ghd Curve Soft Curl Tong (£120) on mid-length hair to re-create this effect. A classic, long bob will always look timeless, as Kylie Jenner proves. A clever (and free) way to change your look is to alter your parting. Here, Margot Robbie has disguised hers altogether with a panel of hair pulled back. Stock up on gel and hair spray if you want to get this look at home. Sure, the wet look isn't an everyday style, but for an occasion, it can set you apart from the crowd. Freida Pinto pairs her wet-look texture with a deep side part. Try VO5 Wet Look Styling Gel (£4). 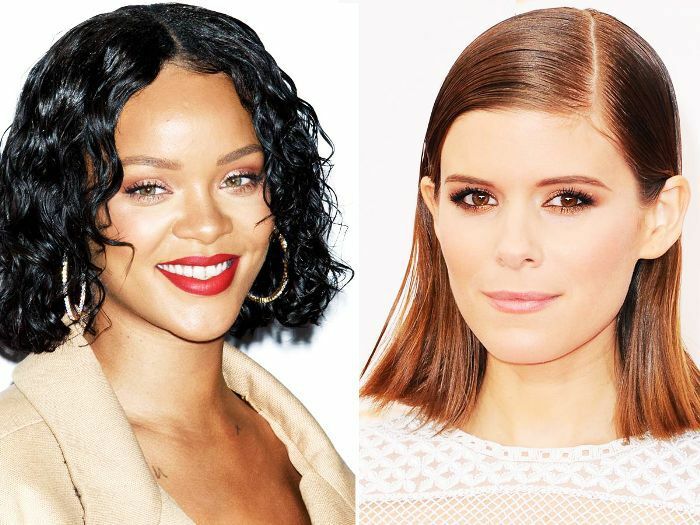 Want a shoulder-length hairstyle that is even more versatile? Make like Emma Stone and have a long side fringe. It can be parted it in the middle or disguised into an updo. Trust Sienna Miller to nail a beachy, boho effect with her mid-length hair. We love the wheat blonde colour, too. To re-create Rihanna's wet-look curls, snap up some scrunching jelly. We love Umberto Giannini’s version for just £7. Rosie Huntington-Whiteley's subtle balayage and easy waves make for one effortlessly glam hairstyle. A blunt-end, shoulder-length bob tucked behind the ear is a great way to show off your favourite earrings—just ask Jessie Ware, who pulls off the cut effortlessly. Elizabeth Olsen is proof that you don't need to spend too much time on a shoulder-length hairstyle. Simply sweep the hair to one side and just tong around the front. You'll be out of the door in no time. Selena Gomez has thick hair, and the fullness lends itself well to this length. The bigger you blow-dry it, the sassier it will look. Here Elisabeth Moss proves that a bouncy blow-dry works just as well on shoulder-length hair—but you'll need extra shine to make it look healthy. Try Balmain Paris Hair Couture Argan Moisturising Elixir (£28). The well-maintained shoulder length meant that Jennifer Lawrence could take her hair to a super-icy white-blonde colour. The piecey texture of the hair throughout the lengths gives it a modern '70s feel. It sits just below shoulder length, so if you're particularly nervous about cutting your hair, start with this slightly longer mid-length. We love the texture in this hairstyle on Chrissy Teigen—not just from the tonging but the highlights, too. Khloé Kardashian looks incredible with her super-blonde shorter hair. The curls give her hair a slightly 80's vibe, and we kinda love it. Next up, tempted to go even shorter? Check out our gallery of short hairstyles.